We are pleased to be able to offer you some wonderful products sourced from around the world. Our YoYo Balloons have been popular in Japan since the 1920’s. The YoYo Balloon is a small balloon that packs alot of fun. Bouncing on the end of a rubber string it is the yoyo that always comes back to you. The YoYo fishing game is great to play at parties, corporate and school events, promising to entertain children and adults alike. 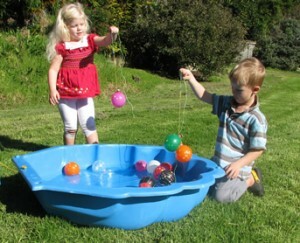 Balloons are put into a pool of water and the challenge is to hook one out – this is your prize. The balloons are very popular at many fundraising events as they are colourful, affordable and easy to set up and sell. Visit kids party games for more ideas for YoYo fun and check out our gallery for decorating inspiration. Peacock Balloons are the diva of our range. They are large at 45cm and have a beautiful peacock feather motif that looks stunning in orange, red, purple, blue and green. The Giant Balloons are also known as Jumbo for they truly are large and impressive! Inflated up to 90cm these latex balloons are perfect for impact at weddings, conferences, baptisms, and photography sessions. All of our balloons can be filled with either helium or air and come in either single or multi packages. Visit our shop page and purchase ” a little bit of fun” for your next event or contact us for further information.